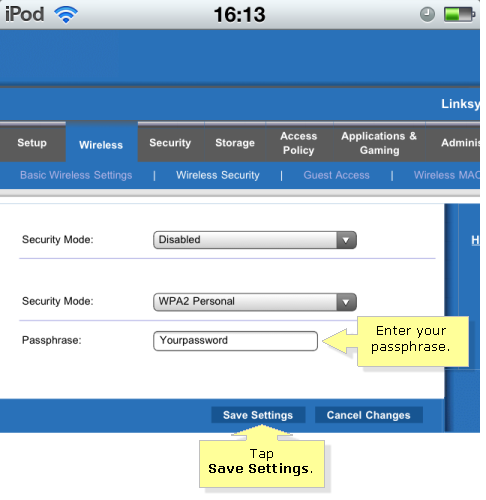 Setting up or changing your Linksys wireless network’s password is also possible through your iPhone®, iPod touch® or iPad®. Your router’s web-based setup page is accessible through the Safari browser installed on these Apple devices. 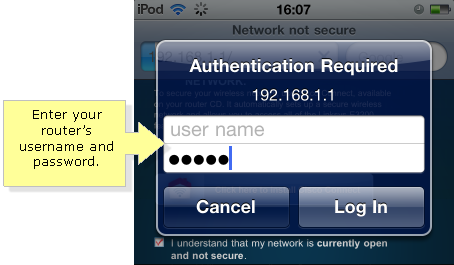 This article will guide you on how to set your wireless network’s password using your iPhone®, iPod touch® or iPad®. On your iPhone®, iPod touch® or iPad® device, tap Settings and then tap Wi-Fi. Tap the name of your wireless network. Press the Home button of your device and then tap the Safari browser’s icon. On your browser’s address bar, enter “192.168.1.1” to be directed to your router’s welcome page. 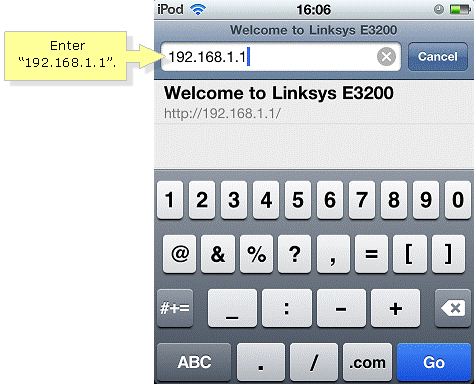 NOTE: The Linksys router's default IP address is 192.168.1.1. NOTE: In this example, the Linksys E3200 router was used. 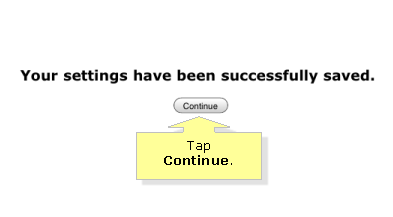 Tap the Continue with an open and unsecured network link to proceed. Tap the I understand that my network is currently open and not secure checkbox and then tap the Continue button. Once the login pop-up box appears, enter the password then tap Log In to access the web-based setup page. NOTE: Your router’s default username is blank, and the default password is admin. In case you have forgotten your password, reset your router and refresh the web-based setup page on your Safari browser. To learn how to reset your router to factory defaults, click here. A warning prompt will appear. Tap OK to continue. 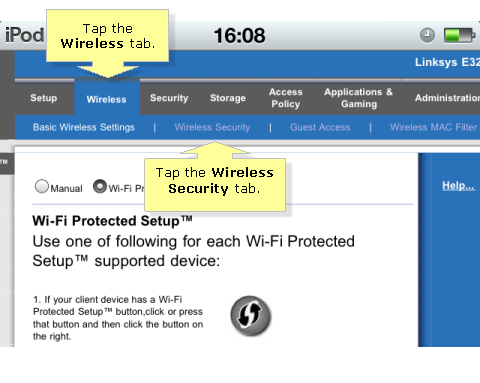 On the web-based setup page, tap the Wireless tab then tap the Wireless Security tab. On the 2.4 GHz Wireless Security, tap the Security Mode drop-down menu to select a wireless security mode. NOTE: iPod touch®, iPhone® and iPad® devices’ wireless connectivity works only with 2.4 GHz Wireless Security. Select your security mode and tap DONE. Enter the password in the Passphrase field and tap Save Settings. Once you receive a notification message that your settings have been successfully saved, tap Continue. 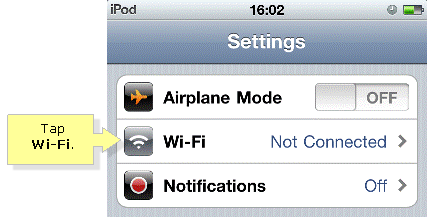 Once you have successfully configured the wireless settings of your router, your iPhone®, iPod touch® or iPad® will get disconnected from the network. You will have to reconnect using your password. To know how, click here.